How times change. 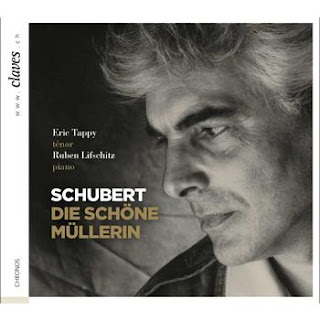 This recording of Die schöne Müllerin by tenor Eric Tappy and pianist Ruben Lifschitz was only made in 1974, but it feels like it is from a different age. Tappy was born in 1931, putting him roughly in the same generation as the first British tenors to take on Peter Pears' mantle, such as Robert Tear and Philip Langridge. His style is much like theirs, emphasising the articulation of the words over the music, and with a distinctive accent that makes the result sound almost like speaking at times. That speech-like quality imparts a valuable intimacy to these songs, encouraging emotional engagement from the listener, while avoiding any sense of over-emotion in the performance itself. Tappy's range of vocal colours is interesting. Most are quite constrained, even reedy at times. His upper register is more narrow and plaintive than the mid-range. The low notes lack weight, but are so rare in this cycle as not to be a problem. Tappy has an impressive talent for starting a word with a plain consonant sound and then very rapidly filling out the timbre, even over the course of a very short vowel. He sings with a very narrow, even vibrato, but you have to listen hard for it. But all these musical concerns take a back seat to the articulation of the poetry, which is immaculately clear throughout. Tappy isn't a native German speaker, but he certainly sounds like one here. There is also drama here, though not as much as I'm used to from more recent recordings. In the more turbulent movements, such as Eifersucht und Stoltz, Tappy is even more emphatic with his consonants, increasing the agogic punch without significantly raising the dynamic. The sound quality does Tappy more favours than it does his accompanist, and the piano sound is frustratingly distant throughout. On the other hand, this may be deliberate, reflecting a different attitude to the relationship between voice and accompaniment in recordings of the time. Certainly, Lifschitz does little to protest against the subsidiary role he is allotted. He is a sympathetic accompanist though, and given that Tappy is emphasising the words so much over the music, the almost implicit status of much of the accompaniment fits well with his interpretation. It is an interesting piece of history, and it has much to recommend it. The packaging is very elegant, especially for a reissue. Not the first choice recording for this cycle by any means, but a distinctive reading that stands up well on its own merits. Sigiswald Kuijken is coming to the end of his Bach pilgrimage, which is taking in one cantata for each Sunday of the liturgical year over a five year period. It hasn't quite managed the same high profile as similar projects by Gardiner or Suzuki, nor indeed has Kuijken achieved the same uniformly high standards as those eminent conductors. His is a more idiosyncratic cycle, and I have had some reservations about the previous instalments. Each disc is recorded in superior SACD audio, but the precision of the engineering is not always matched by the performing style of the orchestra, and the sound has often been merciless in highlighting suspect tuning in the strings and occasional balance problems. 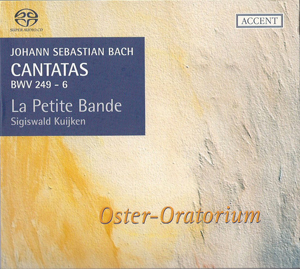 That dichotomy is evident on this disc, of cantatas for Easter Sunday and Monday, with the tight focus of the engineering often at odds with the laid back style of the performance. Fortunately, the technical side of the performances here stand up to the forensic scrutiny of the audio, which finds little wanting. On one occasion there is some loud rattling of woodwind keys, which, considering we are talking about baroque instruments, can only be coming from the bassoon. And one of the arias is accompanied by a tenor/bass string instrument, which the orchestra list suggests is Kuijken himself on the violoncello da spalla; an exotic choice of instrument but not a particularly pleasant sound. Otherwise, the timbres and textures are all very pleasing and easy on the ear. This might be explained by the fact that both of these cantatas, and BWV249 in particular, emphasise the wind over the strings in most of their movements. And the woodwind playing is very good indeed. The players are just as relaxed in their style as the strings, or at least give that impression while playing with both precision and passion. Both recorder and flute are used, the one player alternating, and both give elegant woody colours. The three trumpeters manage to combine flair and restraint to a degree that is all too rare. It is also worth mentioning that they play "fully natural" trumpets, ie without vent holes. That's usually a recipe for some dodgy tuning, but all the trumpet lines here are spot on. As ever, Kuijken works in one-to-a-part mode with no choir. Joshua Rifkin would, no doubt approve, but the four soloists have to work hard to give these boisterous scores their due. The first chorus of the Easter Oratorio (Kommt, eilet und laufet ihr flüchtigen) in particular sounds to me like a work for large choir, and while the singers give us the contrapuntal lines with valuable clarity, the chamber textures seem at odds with the spirit of the score. No such concerns with the solo movements though, and each of the singers really makes the most of their various moments to shine. 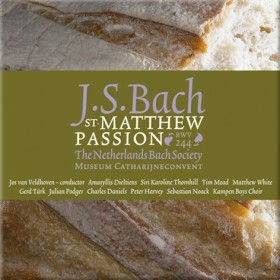 Alto Petra Noskaiová and bass Jan Van der Crabben are both competent purveyors of the Bach's solo lines. Neither excels, but the evenness of their singing has a value in itself. In particular, the fact that Crabben sounds equally at home in every part of Bach's bass register is an asset, and sets him apart from the bass soloists in other recent Bach cantata cycles. But both are outclassed by soprano Yeree Suh and tenor Christoph Genz, who both put in some very special contributions. Genz demonstrates that you don't need to be in the very highest register to give a characterful and passionate tenor performance. Suh has an extraordinary voice, very pure and uncomplicated. She often sounds like a boy treble, and her sound might provide some welcome nostalgia for those who fondly remember the days when these top lines were always taken by boys' voices. Sigiswald Kuijken has his fair share of admirers, who are likely to find much of this recording very much to their tastes. The woodwind playing and the soprano and tenor arias in particular are up to the highest standards of this cycle. But, as with previous instalments, it is a mixed bag, and not everything hits the mark. That is a consequence, I suppose, of Kuijken's easy going approach, which at its best combines spontaneity with a sense of intimacy that fully justifies the use of a minuscule ensemble (a Petite Band indeed). Personally, I'd go for Suzuki or Gardiner every time, but if you find their readings too regimented and too detail-focussed, then Kuijken might just be the man for you. 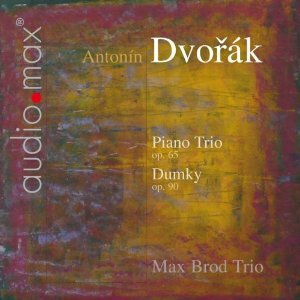 The Max Brod Trio bring a welcome sense of clarity and focus to these well-known Dvořák chamber works. The structure of the Dumky is far from clear-cut, but the players make a convincing case for its unity. And there is also a sense of intimacy that pervades the recording, as you would hope to find in all chamber music, but rarely do. Despite its enduring popularity, the Dumky Trio poses a range of interpretive challenges to performers. Rather than structure the work as a traditional four-movement trio, Dvořák instead gives us a sequence of movements, each in the form of a dumka dance, that is a slow introduction followed by an allegro conclusion. The structure of each individual movement relies on the transition from slow to fast, which Dvořák achieves in a different way in each movement. In each case, he is relying on a sense of surprise, and it is up to the performers to deliver that without relying on undue exaggeration. Of course, nothing comes as a surprise to the players, and there is occasionally a feeling that the meticulous preparation they have put in has damped the spontaneity of these (supposedly) folk dances. The sheer sophistication of this reading is the one aspect of it that may turn listeners off. Dvořák has taken the Ukrainian dance form (which according to the liner he first learnt of from Janáček) and transformed it for a concert hall setting. The players take that chamber music context for granted and make no effort to recapture the music's folk origins. That isn't necessarily a problem, but to me some of the charm is lost, and without those folk inflections the music risks sounding like second-rate Brahms. The slow introductions are also more restrained than you will find in most recordings. Where many performers use the following allegro as an excuse for indulgence in each of the preceding adagios, the Max Brod Trio keep a fairly even tempo throughout, with only very controlled rubato and a sense of direction that keeps the music flowing. That allows the overall work to make more structural sense, but sometimes the slow sections seem in need of a little more space. 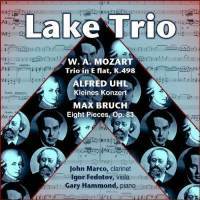 Curiously, the Max Brod Trio recorded this work only four years previously. That was for a different label (Arcodiva UP 0098 - 2 131) and both the violin and cello parts were taken by different players. Perhaps the work makes regular appearances on their concert programmes, or perhaps it just sells well. To me, though, this isn't an ideal performance, it is convincing foil against the many, many over-indulgent readings on the market, but only works on its own terms thanks to the high technical standards of the playing and recording. I'm always curious about how MDG achieve their impressive results, given their avoidance of post-production manipulation. The quality of the performers they work with must be part of the answer. But whatever they do to achieve it, the sound is always good. I'm particularly impressed with the balance here, and the way that the cello provides a focussed bass sound without ever overpowering. In fact, the cello playing from Maximilian von Pfeil, is a real asset for this ensemble. It is elegant and emotive, but without ever being overstated. Chamber performance at its best. The Op.65 Trio suits this ensemble's approach better, I think, than the Dumky. It has a more traditional form and a more involved dramatic architecture that works with rather than against their sophisticated interpretive approach. I love the way that they land running at the start of the work, fully engaging the listener from the very first note. And the quiet interludes here really benefit from the players' continuing awareness of the structural logic, a marked contrast to the rushed feeling that it gives to the Dumky adagios. Despite not being as famous, the Op.65 is a more coherent and logical work than the Dumky. It also provides a much better vehicle for the Max Brod Trio's considerable talents. Heinz Holliger plays Bach Concertos and Sinfonias "Ich hatte viel Bekümmernis"
Heinz Holliger's musical activities have become increasingly diverse in recent years, and his appearances on disc have encompassed the roles of composer, conductor and even pianist. He is, of course, first and foremost an oboe player, and discs of his oboe playing do seem to make intermittent appearances, but most of these are reissues. This disc therefore represents a return to home territory. ECM are making a big thing out of the fact that it is the first recording of Holliger playing core repertoire on the label since 1997. But the programming here is more adventurous than this suggests. Putting together a full programme of solo oboe music by Bach is no mean task. The amount of concertante oboe music that he wrote is more than sufficient but the amount that survives is less so. Or rather, the amount that survives in its original form, for the three Bach concertos here were all originally for oboe (at least in all probability) but have only come down to us in arrangements as keyboard concertos. Given the baroque custom of rearranging works, both the composer's own and other people's, the ethical concerns of "recasting" (as Holliger would put it) concertos for different solo instruments are easily overcome. And everything works here very well on the oboe, which is the main justification that Holliger gives anyway. In one work, the A major concerto BWV1055, a single line solo part is even visible in the score underneath the keyboard arrangement that has been written on top of it. It is a bit low for the oboe, so Holliger performs it on the oboe d'amore instead. The remainder of the programme is made up of solo oboe movements from cantatas, BWV 21, 249 (from the Easter Oratorio), and 12. There is also a concerto by Alessandro Marcello, the arrangement history of which is far from clear in the liner notes. It seems to have been written as an oboe concerto by Marcello, then transcribed for harpsichord by Bach. Now Holliger performs it, taking it back to the original solo instrument, but with ornamentation and edits taken from the Bach version...I think. It's all very confusing. Holliger's playing is as fine as ever. His range of timbres is impressive, as is his confidence in taking the sound right down to a nasal, woody sound when the context requires. The grounded, earthy quality of his sound production is balanced by an impressively lively approach to phrasing, which always keeps the textures light. The interplay between modern instrument and historically informed performing styles is interesting. Holliger performs on a modern oboe, so he doesn't quite have the flexibility of intonation afforded to a period instrument player by their open tone holes. And I don't know what his oboe d'amore looks like, but this too sounds a lot like a modern oboe. There is a valuable discretion in Holliger's sound production. The modern oboe could certainly project more than he does here, and would also be capable of bigger, rounder sounds, which he studiously avoids. The orchestra, too, is a mix of new and old. There are no winds, and the strings play modern instruments with metal strings, but with baroque bows. The results sit somewhere in the middle of the aesthetic spectrum, and perhaps seems to lean more towards the modern instrument sound just because the majority of Bach recordings these days are on gut strings. First and foremost, though, this recording is a showcase of Holliger's talents. To listen to this, you wouldn't guess he is now in his 70s, such is the agility and suppleness of his playing. A fine disc from Holliger, here's hoping there will be many more to come. Douglas Boyd and his Winterthur forces are proving to be a reliable signing for the MDG label. This disc follows an excellent recording of the Rhienberger organ concertos. In both cases, we are talking about music that has made very few outings on CD, let alone SACD, so to find them presented at this quality is a treat. Schubert, according to the liner note, put great energies into improving his reputation as a composer for the stage, but of the ten stage works he completed, only three were preformed in his lifetime. Rosamunde was one of them, and its poor reception was apparently one of the reasons why later stage projects failed to find a home. Problems with the work's dramaturgy have been blamed for its failure, rather than any inadequacies on the part of the music. And the music is good. It falls somewhere between the Schubert the chamber composer and Schubert the symphonist. There is plenty of drama here, but for the most part it retains the civilised formality of the Classical era. Performing the incidental music – and great as it is, the word 'incidental' is definitively appropriate – poses a few challenges. A choir is required, but they only put in a few appearances, as does the alto soloist. Schubert writes trombone parts, but he only uses them to support the choir. So the whole project is a bit impractical, and while you need a range of talented musicians, none is given the opportunity to really show off those talents. Fortunately, the Musikkollegium Winterthur musicians have what it takes. There is some elegant woodwind writing, all of which is beautifully presented. And those trombone parts, brief as they are, are played with enviable precision and tonal focus. Douglas Boyd achieves a good balance between the composer's aspirations to drama and his innate sense of musical elegance. There are a number of points where the music builds up to a thematic statement through a swell on an upbeat or a short crescendo, and Boyd is able to create just the right sense of anticipation, and without excessive intervention. It is probably worth noting that this is very much Schubert on modern instruments. There is nothing wrong with that, of course, but it seems to be rapidly becoming the exception rather than the rule. The textures are warmer and more homogeneous than you get from period instruments, but (unlike in the later symphonies for example) there is little in the way of contrapuntal or textural detail to loose in the textures. That also limits the potential benefits of the SACD audio. The audio quality is good, and it brings a sense of warmth and intimacy to the quieter textures, especially the woodwind solos, but there is little in this score to bring out in terms of pertinent details. The disc opens with a bonus track of sorts. 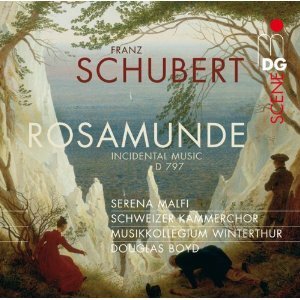 It turns out that Schubert wrote the Rosamunde music to a tight deadline and did not have a chance to write an overture. Instead, the programme opens with the overture to "Die Zauberharfe". The liner note ensures us that the overture is very much in the spirit of the Rosamunde music, and so it is. However, the Rosamunde movements are thematically interconnected (though a theme better known from the quartet of the same name), the overture does not share this link and so stands out from what follows. That's not a big grumble, but it does call the logic of the programming into question. Even with this imported overture, the running time is still under an hour. So why not include a few more overtures and incidental movements too? The standout work on this disc is Berio's A Ronne, an experimental yet consummate vocal ensemble piece, taking in a wide range of vocal techniques, while also exploring issues of language and meaning. Like his earlier Laborintus 2, A Ronne was a collaboration with the poet Edoardo Sanguineti, who again provides a complex and multi-layered libretto, combining several languages and including brief quotes from a bizarre array of sources, stretching from the Gospel of John to the Communist Manifesto. One consequence of this high-brow postmodernism is that only the most culturally astute and language proficient listeners are going to get the majority of the references. There are references in the music too, but for the most part, Berio focusses his interest in the semi-verbal vocal sounds in which he frames the texts. 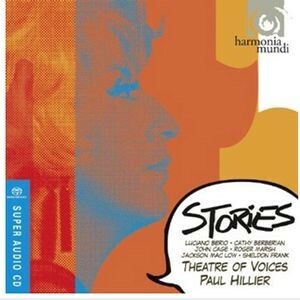 The programme ends with the undisputed classic of unaccompanied vocal Modernism, Cathy Berberian's Stripsody. The score for this piece takes the form of a comic strip, although the performance directions are more specific than this might suggest. For the most part, words are written on a stave, with the fonts suggesting the style of performance. If all this suggests a fight scene in Batman, that is part of the idea, and the resulting work makes explicit references to the comic strip connection. At one point the singers exclaim "Is it a bird? Is it a plane? No, it's Superman! ", and there is some good Tarzan warbling at the beginning too. Berio has maintained an impressive reputation as an independent thinker in the world of post-war avant-garde music, which is all the more impressive given the sheer number of independent thinkers of that school and the extent to which it celebrated individuality. So it is a surprise to find how much A Ronne shows the influence of Stripsody, although both works were written after their composers divorced. The Berio is a more complex piece, and perhaps a more musically successful one, but it is destined always to be overshadowed by Berberian's iconic score. It seems unfair to say this of anything by John Cage, but the other pieces on the disc seem little more than fillers in comparison to these two great works. Cage's Story, based on a libretto, or rather two short lines, by Gertrude Stein, combines extended vocal performing techniques with the aesthetics of minimalism-by-repetition. The results lack substance in terms of interest or musical material, but in a sense that is whole idea. The work does fit into the programme, but only just, and would be better served in an all-Cage programme. Not A Soul But Ourselves by Roger Marsh is an ambitious effort to set lines from Finnegan's Wake. The voices are amplified, enabling very quiet vocal articulations to be used in a variety of fascinating combinations. The result suggests Stockhausen's Stimmung, although that is at least in part a result of the fact that these singers have recorded both scores in recent years, both to an equally high standard. Young Turtle Asymmetries by Jackson Mac Low and As I was Saying by Sheldon Frank are more text performance works than musical compositions. As such, they also fit snugly into the programme, but without adding very much in terms of musical interest. Even so, the Sheldon Frank piece gives an excellent opportunity to hear Paul Hillier's rarely employed cockney accent. The performances here are all first class. The Berio poses the greatest technical challenges, but all are executed with fluency and (apparent) ease. The balance and ensemble between the singers is always ideal, and the sound quality is great. Harmonia Mundi's decision to release the disc on SACD is an excellent one, and the high quality audio really shows off the detail of these works, all those tongue clicks, growls, and transient pianissimo clusters in the close harmonies. None of the works, with the possible exception of Stripsody has any discography to speak of, making this collection especially valuable. It is probably worth mentioning that the Berio is sung in the original five voice version and not in the later eight voice arrangement. Also, Stripsody is sung by three female voices rather than the specified single voice. 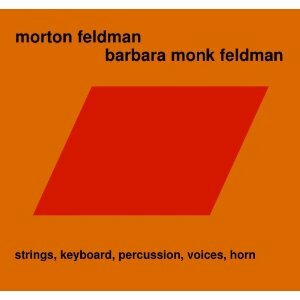 But then, the whole reason that this recording works is that the performers have taken a lively and playful approach to these lively and playful works. A little reinvention is always a good thing, and old as some of these scores are, everything on the recording feels bang up to date. 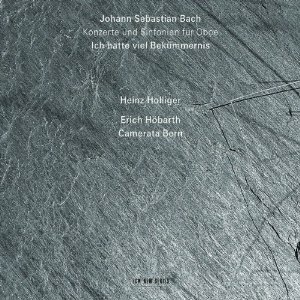 Even though Julius Röntgen has been relatively well served by recent recordings, new releases like this one often seem like surprising discoveries. Usually, you'd expect concertos by second-rate late Romantics to have competent orchestration and counterpoint, but no memorable tunes. But these concertos have all the tunes you could want. The A minor in particular has an exceptionally buoyant and attractive melodic profile. The melodies are perhaps shorter than the ones Brahms or Tchaikovsky would employ, but they are close in stature to either. Röntgen also has an impressive knack of getting the very best from the violin. There are plenty of virtuoso passages here and all sorts of double stopping textures, which all work very well. And his orchestration is as good as anybody's, subtle too, with a wide range of instrumental combinations used to accompany the soloist, but none so exotic as to steal the limelight. That said, the use of horns is very impressive, and of the bassoons, endlessly fascinating. CPO sensibly avoid giving numbers to the concertos, thereby avoiding long-standing confusions. 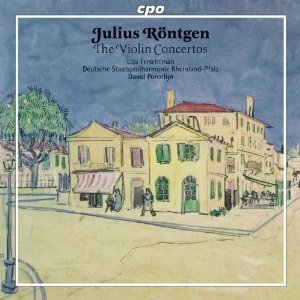 Both of the concertos here have been described as the Concerto No.3 at some point, the confusion stemming from the fact that Röntgen's diaries mention that he had been working on two other violin concertos in the 1870s. It turns out though, that these were both by his wife-to-be, but they still ended up listed in his catalogue. The A minor concerto is the best work on the disc, both the most substantial and the most consummate. It also, as I mentioned before, has the best tunes. The Ballad and the F sharp minor concerto (written for Jelly d'Arányi) are considerably later works. Both have a slightly darker tone and more passages of introverted contemplation. The contrast between the two concertos makes for a satisfyingly varied programme, and the three works together come to a generous 73 minutes. Liza Ferschtman is the ideal soloist for this repertoire. Technically, she is on top of everything that Röntgen throws at her. She has a nimble but never narrow tone, allowing her to give the music its due sense of Teutonic weight, while also infusing every phrase with life and energy. David Porcelijn also manages an impressive balancing act, getting a performance out of the orchestra that is both restrained as accompaniment and symphonic in its bredth. I doubt the orchestral parts pose any serious problems to the players of the Deutsche Staatsphilharmonie Rheinland-Pfalz, but even so, there performance is admirable. Good sound quality too. The acoustic in the Ludwigshafen Philharmonie is a little resonant for the violin when unaccompanied, but the warmth of the sound is ideal for the orchestral textures. A highly recommended release, providing the best possible advocacy for a composer who we should really hear much more from. Boris Godunov responds well to straightforward, visually arresting staging, and that is exactly what it gets here. This 2004 production from Barcelona updates the action to 20th century Russia, although it is difficult to say exactly when. The soldiers' uniforms and the peasants' rags suggest the action is taking place before, or possibly during, the Revolution, while Godunov and Shuisky's modern(ish) business suits imply they are oligarchs of more recent times. The scenery is mostly in a monotone metallic grey, which gives the few props all the more visual impact. Boris' throne is a giant gold chair, which dwarves everyone on the stage, most tellingly the Tsar himself. It also offers an excellent focal point or the crowd scenes, especially when they lift the chair up and parade around the stage with it above their heads. The other ingenious prop is a square portrait of the murdered Dmitri. Initially, this starts out as a Dorian Gray kind of device, a constant presence on the stage and an eerie reminder of how the Tsar achieved his status. But then it gradually takes on the status of an icon, initially worshipped by Grigory, who places candles in front of it as he prays, and later by the whole crowd, creating a point of focus for their growing opposition to the Tsar. It is a simple device, but an effective one, and everything in this staging works on that level. The murder of Dmitri is enacted in mime during the prelude, and his ghost makes regular appearances from then on. Interestingly, the simpleton, who publicly accuses the Tsar in Act 3, is made up to resemble the murdered child, another of the powerful and psychologically direct ideas that characterise the staging. The production is well cast, both dramatically and vocally. 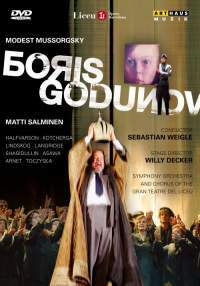 Matti Salminen portrays Godunov as a larger than life but clearly vulnerable leader. He is not the most powerful singer to have taken on the role, but that slight delicacy to his tone only increases the sense of the character's weakness. The late Philip Langridge is on excellent form as the scheming Shuisky. In an opera that is dominated by baritone and bass voices, his tenor voice fits in perfectly, with all the baritonal richness you could want, even in the upper register. But Langridge sends far more time on the stage than he does singing, and while it would have been nice to hear more from him, his arresting visual presence is just as much an asset to the role. The rest of the cast is just as strong, and vocally the production is characterised by the even quality across the board, which given the number of singers it requires is quite an achievement. In one interesting piece of casting, Fyodor is sung by a countertenor, Brian Asawa, rather than the more usual boy treble. It is difficult to say if this adds or detracts from the drama, but his sheer vocal power brings the role up to the levels of intensity of the rest of the cast. Conductor Sebastian Weigle is best known as a Wagnerian, not least because of his fine recent performances at Bayreuth. His Mussorgsky is quite Wagnerian too, very Romantic and with some real power behind the more dramatic sections. The one aspect of the music that he doesn't relish quite as much is the driving, oppressive ostinato-type figures. His sensibilities are a little too refined for this particularly Russian form of musical brutality. However, he is a skilled operatic conductor, and he works well with the singers, giving them the space they need and maintaining an impressive balance between stage and pit, even in the louder sections. The video direction is involving but never fussy. The camera angles are generally quite high, which works well in for the crowd scenes and is also in keeping with the perpendicular style of the sets. The sound serves both singers and orchestra well, although the ladies of the chorus sometimes sound a little shrill. Both the DVD and the production itself, do justice to this impressive opera. The staging is in marked contrast the kind that you would expect from a Russian house, where period costumes are more usual, as is a more static staging style. The cast has a mix of European nationalities, and while there are only a few Slavs, mostly in minor roles, the Russian pronunciation is uniformly impressive. It is customary to criticise Boris Godunov productions that use the original 1869 version of penny pinching, avoiding the longer revised score purely on financial grounds. While that may have been an issue here, there are good artistic reasons for choosing the shorter version. Two and a half hours seems long enough for any opera, and while we are still using DVDs, there are advantages to a production that you can fit on one disc. It is easy to see why Mussorgsky felt the need to even out the dramatic shape of the work, but all of the opera's best music is present in the shorter score. This production doesn't make any excuses for the dramatic disjunctions of the shorter version. Instead, it plays the individual scenes for all there dramatic worth. The production emphasises power, directness and immediacy, ideal qualities for any staging of this brutal and uncompromising work. Mozart's "Kagelstatt" Trio has made many outings on CD, but it is not often coupled with other works for the same combination of instruments. The imaginative coupling here compliments the jaunty classicism of Mozart's work with two more serious 20th century compositions. But both the Uhl and the Bruch maintain the laid back and intimate atmosphere of the Mozart, chamber music at its most approachable. The Kagelstatt is presented here with a wonderful lightness. Tempos are generally on the relaxed side, and nothing is unduly exaggerated. Clarinettist John Marco has a warmth to his sound which sets the tone for the whole ensemble. And despite the unusual combination of instruments, the colours always blend elegantly – Mozart should take some credit for that of course, but so too should the players. Alfred Uhl's Kleines Konzert was written in Switzerland in 1937. Technically, you'd have to describe the style as neo-classical, and there are certainly some elements of Stravinsky's abrasive sound world apparent. But most of the music has a more Romantic feel than that suggests, as if the Viennese spirit of Brahms or perhaps Zemlinsky had been spiced with just a little more rhythm and punch. Again, the performance emphasises the work's chamber music credentials, with the players creating a sense of welcoming intimacy, partly through the sheer precision of their ensemble, but also through the warm tone colours of both the viola and clarinet. This breezy, lyrical performing style belies the sheer difficulty of the music, especially in the outer movements. There are all sorts of fast figurations and scale passages here, which must be tricky for all the players, but which are performed with such elegance and grace that you wouldn't know it. Bruch's Eight Pieces Op.83 is a more sombre affair. Seven of the movement are in minor keys and the whole work has a curiously downbeat air. But yet again, the relaxed and effortlessly melodic style of the performance comes to the rescue, with the players ensuring that the results are always light on the ear and never maudlin. There are one or two places where Bruch writes for the clarinet and viola in unison and sometimes they don't quite manage to stay in tune, but that is about the only technical problem anywhere on this disc. The recorded sound, like the performance itself, emphasises roundness of tone over specific details. The piano sounds a little distant, but nothing is really lost as a result, and the viola and clarinet are excellently represented. All round, then, an enjoyable disc. If you are thinking of buying it, the chances are you've been attracted by the Mozart. To be honest though, the Uhl and the Bruch are just as enjoyable, and make for an interesting and satisfyingly diverse programme. 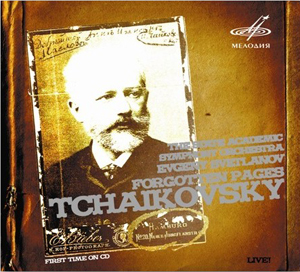 How 'forgotten' are these 'Forgotten Pages' from Tchaikovsky? The Storm and Hamlet are not his most famous works, but both get occasional airings, both on CD and in the concert hall. Fatum and the two dances at the end of the programme (both of which are extracted from opera scores) are more unusual offerings. But the composer's skill shines through each of these works. Their melodies are perhaps a little less memorable than his best, and the dramatic structure of the three tone poems is not as focussed as in his finest scores, but this is still great music. The lack of opus numbers on the sleeve could lead to some misunderstandings. With that in mind, it is worth stating that the first track, The Storm, is Tchaikovsky's Op.76, an early work that was only performed and published posthumously (and not his Op.18, which goes under a similar name). There is plenty of drama here, but the narrative dimension (the work is based on a play by Ostrovsky) is more difficult to pin down. Fatum has no such aspirations to narrative structure, as so fares better. It is another early work, but the composer's skills in melody and orchestration are again evident. Hamlet is famous enough, I think, to justify a higher place in the billing, and even a mention on the front cover. Then there are the two dance movements on the end, which after such dramatic tone poems, do feel like light fillers to pad out the programme. Not that the audio should prevent anybody from paying the reissue price they are asking for this disc. (Is is a reissue? It claims on the cover to be the first time on CD.) Russians love anniversaries, and the stated justification for the original concert was to mark the 150th anniversary of Tchaikovsky's birth, while the (re)issued recording marks the 170th anniversary. Twenty years down the line, we also have another Russian legend to commemorate, Svetlanov himself who died in 2002. And this is classic Svetlanov: focussed, driving, energetic, and above all, deeply Russian. It seems the identity of the first track on this disc is even more problematic than I had previously suspected. A reader has written in pointing out another review which identifies the work as the Overture in C Minor. Examination of the scores reveals that this is indeed the case. The mistake on the track listing may be a result of the fact that the two works, the Overture in C Minor and The Storm Op.76, share themes and have almost exactly the same opening. This may come as a disappointment to Svetlanov fans, as he has recorded the Overture before but not The Storm. Apologies then to anybody who thought this was a significant new find in the, now sadly finite, Svetlanov discography.